Here is a very small incomplete picture of the pattern I used (I want to encourage you to go buy the book, not infringe on someone’s publication). 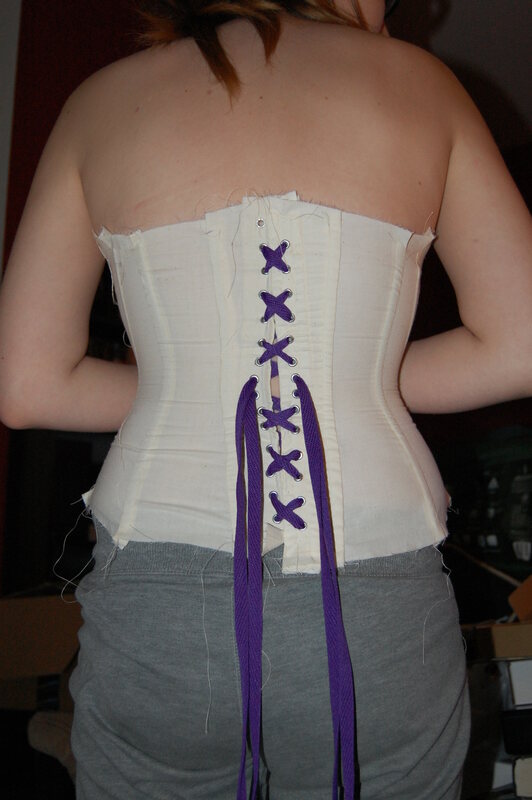 I loved the simplicity of this pattern, the others were also gorgeous, but I am still new to corset-making, so while I know HOW to insert gussets, they still make me a bit nervous in corsets. Here is my drafting of the pattern, exactly as it is written. I like to make my changes to any patterns after I do my muslin. I alter patterns all the time (both in knitting and sewing) but I like to honor the pattern maker, so unless I have my own vision for what it will be (like my Tardis Boloro, that will be all me) I like to see what it looks like before just changing things willy-nilly. So my next task is to draft out the pattern with the extended waist line. The hips, I think are just fine, and the bust when pulled up is also looking to be right (It was hard to tell, as the corset waist was pulling a bit when I pulled it up to check the bustline). This does have the boning in it, as you can tell from that side view, so I think that once I change the waistline, it’ll fit much better. I have to head off to work in half an hour, but maybe I’ll have a fully drafted pattern by then! I have decided. My next big project is a Tardis Dress. I have it all planned out, with sketches and basic designs. My goal is to have this dress ready to wear by May. Why May? There is a local con that gathers in May, and I would like to have it done before then. Until then, my test piece (to see if I have the skills) is going to be a full out historical bustle period dress. Which period, might the historically savvy of you ask? I am leaning between the late bustle and natural form periods. So about 1870ish to 1883ish. Why do this period as a test? Good question. My Tardis dress as it stands is sort of taken from the episode, “The Doctor’s Wife”. Her dress in that was a bit more late period (maybe turn of the century), but this is still where I draw my inspiration from. The sketches I made to this are simple and not very good, but I’ll try to scan them in later. (My printer/scanner went kaput the other day, and I can’t figure out how to get my pictures on my new computer, so that’s out for the time being…) The plan is currently like this: A natural form bustle dress with a Tardis corset with embroidered paneling (the PULL TO OPEN part of the Tardis) and a light up hat. So why a historically accurate bustle dress to practice? I have made very few full detail dresses so far, and only two without help a very long time ago. So I feel like I need to stretch my sewing skills and take them for a spin. Plus I have some really nice (donated) suiting fabric that I can make this dress out of (it is a blend of non-natural fabrics (I believe) *cringe*, but it was free….so….). I do not have the money to be going out and spending money on the fabric for this dress, so using the materials I have I can test my skills and while doing so, gather up the materials for my Tardis dress. I plan to go all out on this dress, so I need to save quite a bit. So far I have drafted up a corset from Fashions of the Gilded Age, Volume 1: Undergarments, Bodices, Skirts, Overskirts, Polonaises, and Day Dresses 1877-1882, I’m doing the Corset Without Gussets on page 54, for anyone who has it . It came out rather nicely, and I do have pictures, but I need to figure out my camera and computer before I can get them out to you. (I’m horribly not-tech-savvy if you haven’t noticed) This corset was beautiful but I need to add a full four inches to the height, as it only gave me three between the underbust and top of the hip. I’ve never fully completed a corset on my own yet, but I do buy cheap corsets from ebay and take them apart to put in real boning. 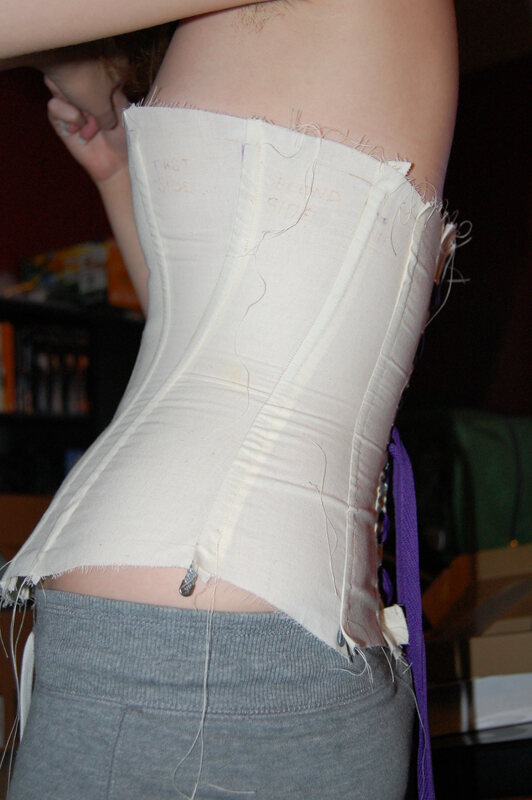 At 10-25 dollars a pop and less than that for the boning, it’s a cheap easy way to dissect a corset and learn the ins and outs. I have made chemise and drawers before, so I’m not overly worried about them, but the outfit itself is a little worrying to me. I may have dabbled in sewing my entire life, but this is entirely new to me. I’m crossing my fingers! 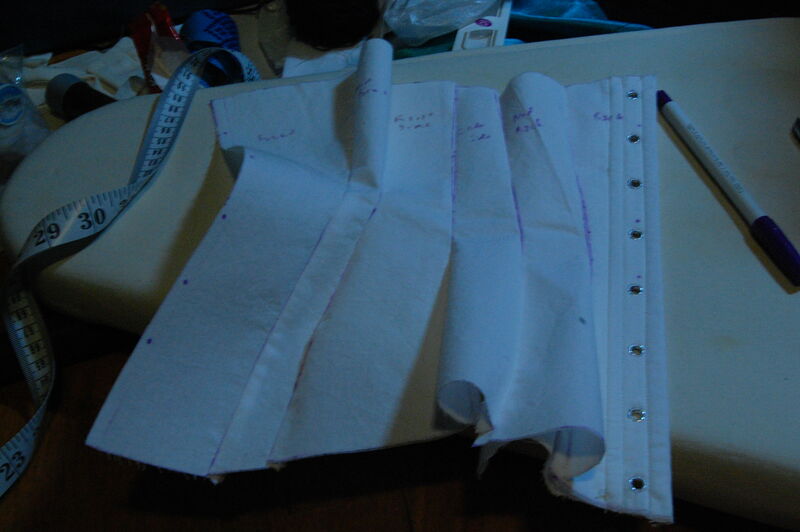 Hopefully by the end of the weekend, I’ll have a fully drafted chemise, drawers, and corset. I am going back to school on Aug 18th, so I’ll have little time then to work, but I’m determined to make this work. As a short reminder I am currently on a countdown until Halloween and working out of Frances Grimble’s book,Fashions of the Gilded Age, Volume 1: Undergarments, Bodices, Skirts, Overskirts, Polonaises, and Day Dresses 1877-1882 . I have currently 48 days to complete an outfit for Halloween, or I have to wear one of the ‘cheap’ store outfits that are expensive for cheap materials. (I’m a bit disappointed with the quality of them, if you can’t tell,) So if I don’t want that to happen, I have to get cracking. Yesterday I had a half day because of some commitments I didn’t know about, so I only worked until about noon. That means that I didn’t get as much done as I hoped, but I plan on making up that time soon. I had most of the half done on Tuesday, but had to redo a bunch of seams. Out of this pattern I have finished the right side of my corset, except for some of the boning which I measured for and ordered yesterday. I previously stated that I sew slowly, this is proof. This is all I did in seven hours. 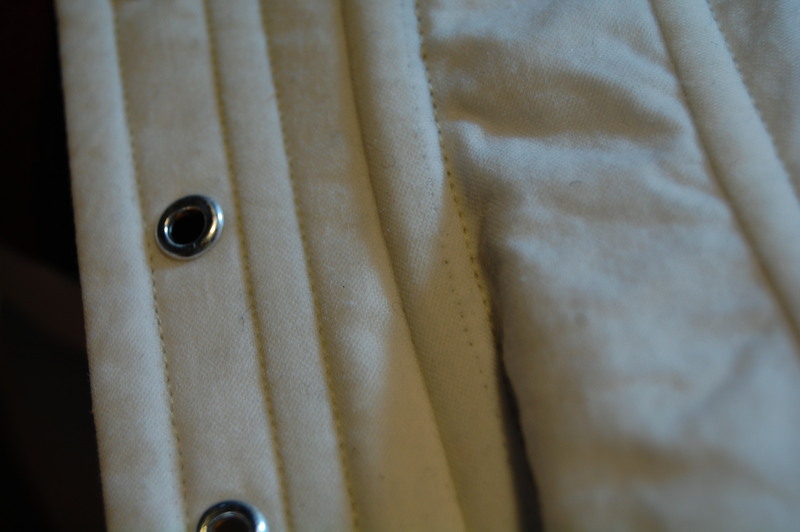 I put in the boning and eyelets on the back piece. I sewed the seams to each other so the sides would line up really nicely. 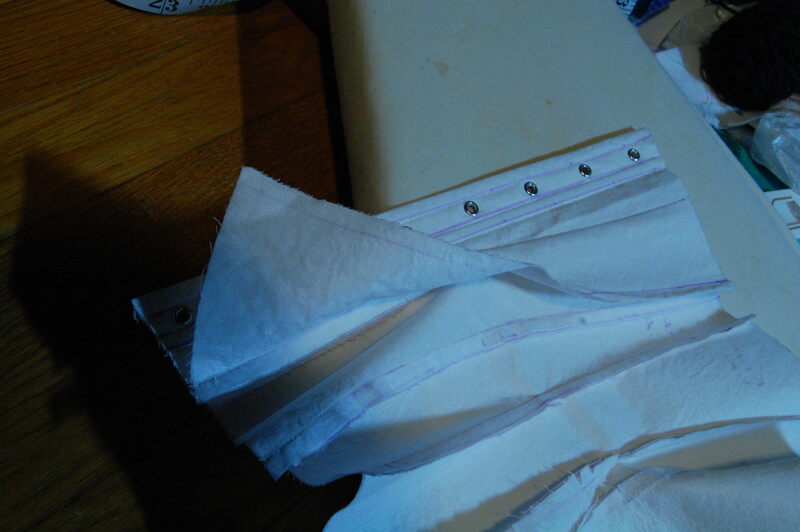 The middle I folded over the seam allowance on the back side and placed it over the front and sewed up the side seam. The boning channels I eyeballed and had to rip out quite a few times. It took all of yesterday’s three hours to sew up five boning channels. Today I plan on sewing up the other side. 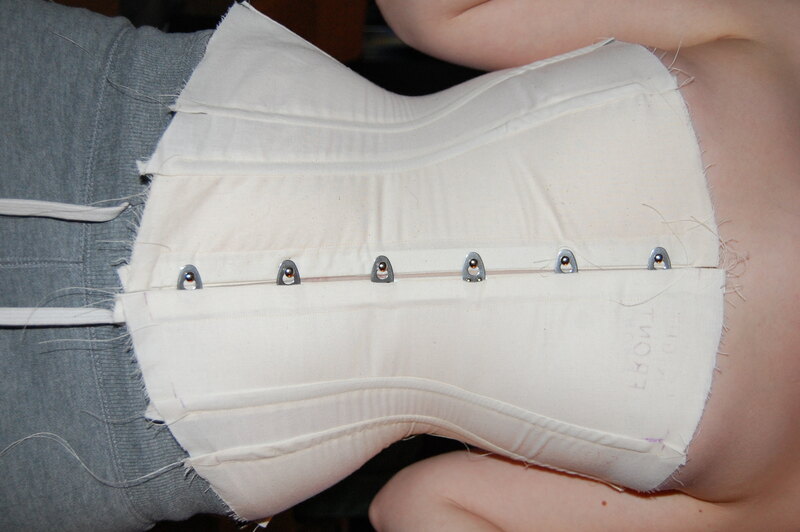 Hopefully by tomorrow I can finish this corset and have it sitting waiting for me to put in boning when it comes. I did forget to buy laces, but I think I can find something to use in the meantime. This decision is probably one of the most daunting, daring, deranged, and dumb things I have ever done. This is all of those things for a few reasons: I have never finished a full outfit in my life. I am one of those people who start something and then never finish for whatever reason…. I am working on this, which is one reason why I have given myself this impossible goal. I have a back-up idea if this doesn’t work, ’cause I can’t go through Halloween without a costume. A second good reason this is an impossible decision is that I have never made a corset in my life, and my entire outfit depends on having a good corset that works well and fits perfectly. The third reason is that I have from 9 am to 5 pm every weekday to do this. I am treating this like a regular job (seeing as my current one isn’t). The fourth and final reason why this may be the stupidest thing I’ve ever done is because I am trying to get a full layered outfit done in fifty days, with well made muslin mock-ups and streamlined final products. This is how this is going to work: I am going to work, and at the end of my ‘work day’ I’ll post what I have done the previous day (so I can get my pictures all pretty), and briefly describe what my plans are for the next day. This way I can have a steady record of what has been done and what needs to be done. So what prompted this crazy venture into something that is impossible for someone of my intermediate sewing skills? I recently purchased Fashions of the Gilded Age. It is a wonderful book with beautiful pictures and over 100 awesome patterns. Now, I have been sewing for most of my life, and I’ve made all of my Halloween costumes. Previously however, all of my costumes have been modified from existing patterns (mostly Simplicity) and I have not had much luck in drafting my own. After purchasing this book, I did a (very) brief scan online to see if anyone had made any of the patterns from this book and it came up surprisingly empty. So I plan on going through most of the patterns and making them with reviews on my struggles with the patterns and (hopefully) helpful tips to others trying these patterns. As previously stated, I have trouble finishing things, so I gave myself this deadline to kick myself in the rear to hit the ground running with these patterns. 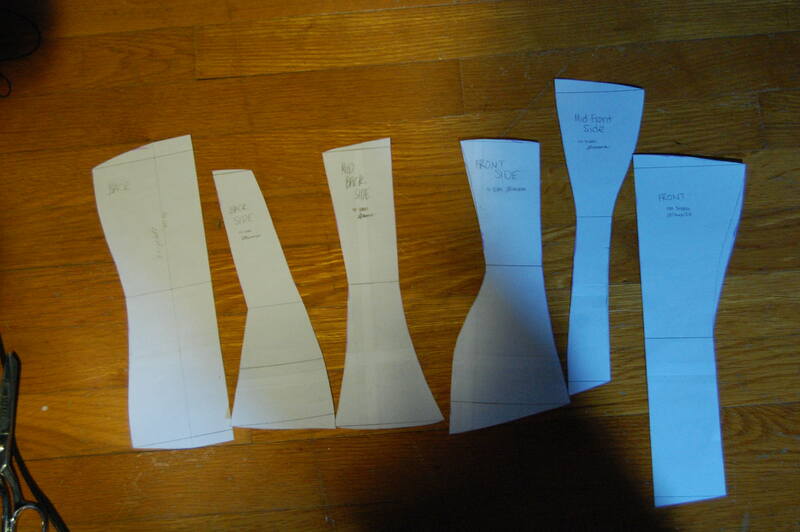 Today I drafted and cut out “Corset without Gussets” on page 54. I have sewn together one side and since I took a three hour break to make pot-roast for dinner, am going way over my self-imposed deadline. I plan on working on the other side tomorrow, and order boning after it’s measured properly. So far I think it’s coming out wonderfully, but it may be a bit small. Wish me luck and until tomorrow!